Due to the high demand for space, the Our Community calendar is used only for nationally significant events. Submissions for the calendar should be sent to service@ourcommunity.com.au. Many people now know that eating too much salt is bad for their health and are looking to cut down. However, whilst you can take control of your salt intake when preparing food at home by reading the labels and not adding salt, when eating out out of the home it can be difficult to know where to start. April is Leo Club Awareness Month - an opportunity for Leos and Lions to raise awareness about the importance of engaging young people in the community through the Leo Club Program. Parkinson's Australia is the national peak body and charity representing more than 80,000 Australians living with Parkinson's. Parkinson' Australia advocates for the Parkinson's community, promotes best practice models of service delivery, works to increase awareness of Parkinson's and provides information and education on Parkinson's symptoms, diagnosis, causes and treatments. Greyhounds are very gentle dogs, but unfortunately the racing industry breeds far too many every year. They are exploited and mistreated by the racing industry which only has use for them while they run profitably. If the greyhound is not profitable it is most likely killed. It is a sad fact that only a fraction of the approximately 20,000 greyhounds bred each year is alive to be re-homed. Greyhounds need little exercise and generally spend about 18 hours a day sleeping, making them very suitable for people little in apartments. Sexual Assault Awareness Month (SAAM) originated in the USA in the 1980s as a week-long awareness raising event. SAAM is now an internationally recognised campaign held every April. Go Supermarket Free this April to support local business, farmers and suppliers. Change your habits and buy local! Ovarian cancer is an insidious disease, often known as a "silent-killer" as symptoms are vague and often strike without warning. By wearing a white shirt or t-shirt on this day you will be showing your support for women and their families impacted by ovarian cancer along with the OCRF's vital research. Each year International Creativity and Innovation Week is a celebration of new ideas, imagination and anything that has made the world a better place. Nature Play Week celebrates initiatives of all shapes and sizes that reconnect kids with nature and the outdoors. The week is filled with over 40 Nature Play experiences for kids and their families facilitated by dozens of wonderful local organisations, parents and schools across Victoria, and beyond. World Heritage Day is an opportunity to appreciate heritage monuments and sites for the international community. The day offers an opportunity to raise the public's awareness about the diversity of cultural heritage and the efforts that are required to protect and conserve it, as well as draw attention to its vulnerability. Celebrate our nation's multicultural makeup with 1500 events across Australia during April. Good Friday is a religious holiday primarily observed by Christians commemorating the crucifixion and death of Jesus Christ. The Good Friday Appeal is a unique fundraising activity that brings together people from all parts of the community in a very special way. The common goal is to raise money for The Royal Children's Hospital in Melbourne. Probably the best known Jewish holiday, Passover commemorates the story of the exodus, where the Israelites were freed from Egyptian slavery. On Easter Sunday, Christians celebrate the resurrection of Jesus Christ after his crucifixion. Earth Day is a celebration of the environment we all share. It also acts as a day of conservation awareness. The proclamation of 22 April as International Mother Earth Day is an acknowledgement that the Earth and its ecosystems provide its inhabitants with life and sustenance. It also recognizes a collective responsibility, as called for in the 1992 Rio Declaration, to promote harmony with nature and the Earth to achieve a just balance among the economic, social and environmental needs of present and future generations of humanity. World Allergy Week aims to raise awareness of the impact of allergy in our communities. The Allergy and Immunology Foundation of Australasia and ASCIA (as a member society of the WAO) are supporting this initiative in Australia and New Zealand through our new 'wear a spot of red' campaign. This campaign encourages our supporters to help raise awareness and funds to support research into allergy, by wearing a spot of red or holding an event in their home, school or workplace. Celebrated on a day when many great authors have died, including Shakespeare, World Book and Copyright Day is a world-wide tribute to books and authors. It also encourages people to discover or rediscover the pleasure of reading. International Guide Dog Day is a day to celebrate the important role that guide dogs play in helping the blind and vision impaired enjoy safe and independent travel. The Young Women's Christian Association (YWCA) celebrates women's leadership and acknowledge their own part in a global movement of women working for justice, peace, health, human dignity, freedom and care for the environment. ANZAC Day is more than a commemoration of the day ANZAC troops landed on the beach at Gallipoli in 1915, it is a day of remembrance for all Australians who served and died in all wars, conflicts and peacekeeping operations. A celebration of one of the world's most beloved creatures and a call to action for their conservation. World Intellectual Property Day is an opportunity to raise awareness of how patents, copyright, trademarks and designs impact daily life. It also aims to increase understanding of how intellectual property protection helps promote creativity and innovation. The World Day for Safety and Health at Work is an annual international campaign to promote safe, healthy and decent work. It is held on 28 April and has been observed by the International Labour Organization (ILO) since 2003. 28 April has also for long been associated with the world's trade union movement's commemoration of the victims of occupational accidents and diseases. Based on a concept from a Catherine Ryan Hyde novel, Pay It Forward Day urges people around the world to commit random acts of kindness. It is a day to do good deeds, and instruct the recipient of your good deed to 'pay it forward', and return the good deed to another person. Each year the Heart Foundation uses Heart Week as an opportunity to shine a spotlight on the problem of heart disease and to help improve the heart health of all Australians. This commemoration will provide an opportunity to pay tribute to the victims of chemical warfare, as well as to reaffirm the commitment of the Organization for the Prohibition of Chemical Weapons (OPCW) to the elimination of the threat of chemical weapons, thereby promoting the goals of peace, security, and multilateralism. The Red Shield Appeal is The Salvation Army's signature fundraising drive which helps fund a vast network of social and community services. The Red Shield Appeal began in 1965 and funds programs and services ranging from providing shelter for the homeless, assisting families in crisis through practical support and financial counselling, to guiding people with addictions through to a clean, healthy lifestyle. The appeal kicks off with offical launch events around the country where corporate and community leaders are invited to be our partners in mission. It's easy to forget, to delay, to decide it takes too long to sit down and write down whole sentences of thought in our multi-platform, hyper-distracted culture. But Email Debt Forgiveness day is an awesome motivation to catch up on those emails you've meant to send or are anxiously avoiding. Together, we can all make our inboxes less stressful for another year. In November 2011, the UNESCO General Conference proclaimed 30 April as "International Jazz Day". The Day is intended to raise awareness in the international community of the virtues of jazz as an educational tool, and a force for peace, unity, dialogue and enhanced cooperation among people. Many governments, civil society organizations, educational institutions, and private citizens currently engaged in the promotion of jazz music will embrace the opportunity to foster greater appreciation not only for the music but also for the contribution it can make to building more inclusive societies. Beltane was a traditional Gaelic harvest festival, and was popularised as the 'Celtic new year.' It traditionally marked the beginning of summer. Wear red lipstick and help kiss goodbe to MS. Throughout May you can get involved in Kiss Goodbye to MS events and activities taking place across the country. By taking part you will be helping support people with MS through funding vital research into the cause, cure and better treatments for the disease. Our vision is to create a world free of MS.
One in Five... is the number of Australian two-year olds who have already developed identifiable, clinical and serious indicators of mental health difficulties. That's around 200,000 babies and young toddlers every year who are facing mental health issues, before even starting pre-school. The IAIM invite you to participate in the One-in-Five Challenge to help reduce this number, and to give all babies and children a better shot at life-long mental health. International Composting Awareness Week is a week of activities, events and publicity to improve awareness about the importance of this valuable organic resource and to promote compost use, knowledge and products. National Youth Week is an annual, weeklong celebration of young people (12 to 25) throughout Australia. National Youth Week encourages youths to share ideas, attend events, discuss youth issues, showcase their talents and even have a bit of fun. Domestic and Family Violence Prevention Month is held during May each year to raise community awareness and promote a clear message that domestic and family violence will not be tolerated in our communities. 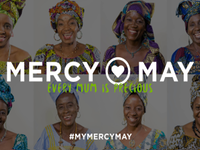 This May, join with Mercy Ships to help women in Africa by hosting a Mercy May event. Helping is easier than you think! Just get your friends together for a good time and raise money for a great cause in the process. There are so many ideas for the kind of Mercy May event you can hold. All you have to do is pick one. Mindful in May brings the benefits of meditation together with an opportunity to help bring clean water to those living in the developing world. Your donation and fundraising will be used by Charity Water in its mission to solve the water crisis. When you register and donate, you'll receive a one-moth meditation program. Crohn's and Colitis Awareness Month aims to bring attention to Inflammatory Bowel Syndrome, which affects more than 5 million people. EAT GOOD. DO GOOD. FEEL GOOD. Victoria's homelessness crisis now affects almost 23,000 people. 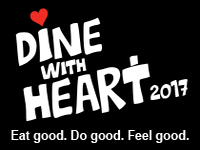 Throughout May, participating restaurants, cafes and bars join will forces with diners to raise money to support Sacred Heart Mission's Meals Program, which provides hearty, free meals every day for up to 400 people experiencing homelessness, disadvantage and social isolation. The aim of Neurofibromatosis Month is to provide information to the community and to healthcare and educational professionals, so that they will better understand what Neurofibromatosis (NF) is. This will enable them to accept and provide support to those affected by NF. The National Cystic Fibrosis 65 Roses Campaign is hosted during the month of May. Each year the National Office in conjunction with its State and Territory associations host many awareness initiatives and fundraising events through May. For the last couple of years we have encouraged people to participate in a challenge themed around the number 65. Supporters have embraced this concept with many wonderful ideas for challenges. To raise awareness and funds for premature and sick newborns, their families and the hospitals that care for them. 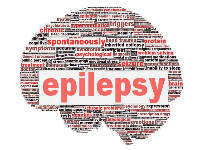 Art for Epilepsy brings together the talented Australian artists in support of those impacted by epilepsy in an online auction. A broad range of artists take part to provide something to suit all tastes and budgets. Each work contains the colour purple, the internationally recognised colour for epilepsy, and are auctioned off through our website. Grab yourself an original piece of art for a great cause! National Family Day Care Week offers a chance for the family day care sector to unite and celebrate the amazing work of educators and approved services in shaping the lives of more than 142,400 children around the country. Since being formed as an Australian children's charity in 1988, the Starlight Children's Foundation has brightened the lives of seriously ill and hospitalised children, and their families, throughout Australia. On May 2, Starlight need your help to raise money for sick kids. pay tribute to journalists who have lost their lives in the line of duty. They are the closest living relative of the tyrannosaurus rex and they outnumber humans on this earth by more than 6 to 1. Yet for the 43 billion chickens on this planet, so few are ever seen. Described as inquisitive, intelligent, affectionate and fun loving, these creatures have their special day on May 4th, which is International Respect for Chickens Day! May 4 is called Star Wars Day because of the popularity of a common pun spoken on this day. Since the phrase "May the Force be with you" is a famous quote often spoken in the Star Wars films, fans commonly say "May the fourth be with you" on this day. Many of us don't get out into nature much. We're too busy, plugged in to screens and rushing through our busy lives. But nature is crucial to our health and wellbeing - and to the health of our planet. Nature is our life support system. It underpins our communities, our economy and our livelihoods. We all need clean air and healthy rivers, yet our politicians seem determined to exploit and damage the environment. But when nature is diminished, so are we. That's why we're holding Play Outside Day. Let's reclaim nature and grow our connection with each other and the places we love! May is International Respect for Chickens Month celebrating chickens and protesting the bleakness of their lives in farming operations. The Ride to Cure Diabetes creates a great opportunity to raise awareness and funds for type 1 diabetes. Held in the Barossa Valley, Riders choose to challenge themselves on one of three professionally run courses of 35km, 80km or 160km. Some people come for the day while others stay for the weekend commemorating their great achievements with superb food and wine and fantastic accommodation. From 4-8 May, thousands of Australians will eat on $2 a day for five days. Feeding yourself on $2 a day is the equivalent of living below the extreme poverty line. It's a way to raise much-needed funds for Oaktree's overseas partners, as well as gain a unique insight into some of the challenges faced by those living in extreme poverty. Sydney to Surfers Charity Ride - raising much needed funds for Father Chris Riley's Youth off the Streets. Victorian drivers are being urged to turn on their headlights as a simple, free and highly visible gesture, to remember those impacted by road trauma and show their commitment to road safety. May 5 is the International Day of the Midwife. The aim of the day is to celebrate the importance of midwifery. Organisation: Eating Disorders Foundation of Victoria Inc.
International No Diet Day (INDD) celebrates body acceptance and diversity. It encourages everyone to have a healthy and balanced relationship with food, exercise and their body, no matter what size or shape they are. Organisation: Tourette Syndrome Association of Vic. The aim of Tourette Syndrome Awareness Week is to spread knowledge of what Tourettes is, as well as ask for understanding and acceptance in the community and to undo the social stigma created by misinformation. Ramadan is the ninth month of the Islamic lunar calendar. Every day during this month, Muslims around the world spend the daylight hours in a complete fast. International Tell Your Crush Day was hatched out of a simple and honest desire to see more people be open and honest about the world around them. National Domestic Violence Remembrance Day is a day to remember those who have died and the ones left behind due to domestic and family violence. World Asthma Day (WAD) takes place each year on the first Tuesday in May. Initiated by the Global Initiative for Asthma in 1998, the National Asthma Council Australia (NAC) embraces WAD and marks the occasion to highlight the need for ongoing care and vigilance in managing asthma. 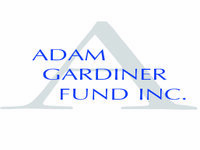 National Amyloidosis Day intends to raise funds and awareness for Amyloidosis. Amyloidosis is a group of diseases in which abnormal protein, known as amyloid fibrils, builds up in tissue. Celebrated on the day the Red Cross founder, Henry Dunant (1828-1910), was born World Red Cross Day celebrates the important work done by the staff and volunteers of the Red Cross and Red Crescent movements. An international time to remember those all those who lost their lives during the Second World War, regardless of what side they fought on. Particularly targeted at young drivers, Road Safety Week aims to increase awareness of the dangers present on the roads. Orangutan mothers and babies have an incredibly close relationship. Baby orangutans don't have a support network around to give them the many lessons of finding food, building nests and other survival skills. Because of the growing demand for palm oil, though, more and more orangutan mothers are being killed every year on the islands of Borneo and Sumatra. Lupus is an autoimmune disease that may cause abnormalities in the function and structure of such vital organs as kidney, brain, lungs etc. World Lupus Day raises awareness about this disease. World Migratory Bird Day (WMBD) was initiated in 2006 and is a global awareness-raising campaign highlighting the need for the protection of migratory birds and their habitats. On the second weekend each May, people around the world take action and organise public events such as bird festivals, education programmes and birdwatching excursions to celebrate World Migratory Bird Day and to help raise awareness around a specific theme. Every year International Nurses Day is celebrated on the anniversary of Florence Nightingale's birth. It is a day to celebrate the role nurses play in the care of their communities. An annual tradition, the Mother's Day Classic fun run and walk provides the community with a great way to celebrate Mother's Day and raise funds for breast cancer research. Mothers Day is the annual celebration of mothers and the hard work they do. May 12th has been designated as International Awareness Day for Chronic Immunological and Neurological Diseases (CIND) since 1992. The diseases included in CIND include Myalgic Encephalomyelitis/Chronic Fatigue Syndrome (ME/CFS), Fibromyalgia (FM), Gulf War Syndrome(GWS) and Multiple Chemical Sensitivities (MCS) May 12th was chosen as it is the birthday of Florence Nightingale. She was believed to have suffered from ME/CFS. Law Week is an annual event, held in May, to promote public understanding of the law and its role in society. 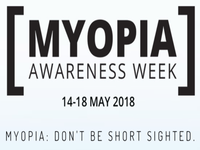 To encourage the new standards of care (myopia control and management) to be adopted by optometrists. Schizophrenia Awareness Week is an annual event used to raise community awareness and understanding of the mental illness. 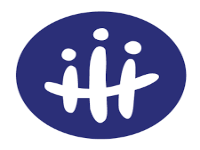 The International Day of Families is an opporunity to raise awareness of issues relating to families in the international community. On May 15 each year, Tuberous Sclerosis Complex Global Awareness Day is celebrated around the country and the global. Tuberous Sclerosis Complex (TSC) is a devastating rare disease that affects more than 2000 individuals in Australia and thousands more carers, families and friends who live with the impact of the disease. National Families Week is a time to celebrate with your immediate family, make contact with your extended family and friends and share in the enjoyment of family activities within the wider community. It is a time to celebrate the meaning of family and to make the most of family time.